The present study aimed to evaluate whether the detailed observation of pH/MII waveforms and the analysis of baseline impedance (BI) values could detect esophageal dysmotility in pediatric patients with esophageal disorders. Eleven patients with congenital esophageal disorder in whom pH/MII was conducted from April 2011 to June 2015, were enrolled in this study. 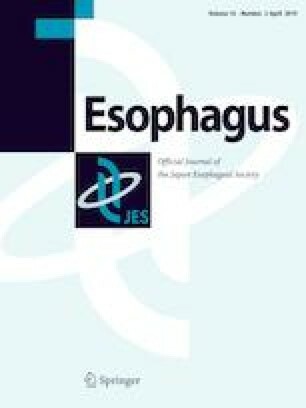 The diagnoses of the patients were as follows: postoperative esophageal atresia (EA), n = 6; esophageal achalasia (EAch), n = 4; and congenital esophageal stenosis (CES), n = 1. The characteristics of the pH/MII waveform, pathological GERD, BI value, and the average BI value of the 2 distal channels (distal BI; DBI) were analyzed in each disorder. Two EA (33%) patients and one EAch (25%) patient were diagnosed with GERD. The mean DBI values of the EA, EAch and CES patients was 912 ± 550, 2153 ± 915 and 1392 Ω, respectively. The EA patients showed consistently low DBI values. One CES patient and two infantile EAch patients showed postprandial prolonged low DBI values. Whereas, the pH/MII waveforms of the adolescent EAch patients were difficult to interpret due to their extremely low BI values. The present study demonstrated that the detailed observation of the pH/MII waveforms in all channels and the analysis of BI were useful for evaluating esophageal motility in children with congenital esophageal disorders. In particular, infantile patients with EAch showed DBI findings that were distinct from those of adult EAch patients. Considering the difficulty of performing esophageal manometry in young children, the detailed observation of the pH/MII waveform may help in the diagnosis of esophageal dysmotility in children. The authors thank Brian Quinn, Japan Medical Communication, for his critical reading of the manuscript. Daisuke Masui and Suguru Fukahori designed the research study, analyzed the data and wrote the paper; Minoru Yagi and Yoshiaki Tanaka designed the research study and wrote the paper; Shinji Ishii and Naoki Hashizume analyzed the data; Nobuyuki Saikusa, Motomu Yoshida, Naruki Higashidate, Saki Sakamoto, Shiori Tsuruhisa and Hirotomo Nakahara performed the research. The protocol of this study has been approved by the Kurume University Ethical Committee (No. 2575). Informed consent was obtained from the families before starting this study. Drs. Masui, Fukahori, Ishii, Hashizume, Saikusa, Yoshida, Higashidate, Sakamoto, Tsuruhisa, Nakahara, Tanaka and Yagi have no conflicts of interest or financial ties to disclose.